There is, in a sense, a purpose to remaking Sam Peckinpah’s excellent Straw Dogs (1971). Strip away Peckinpah and writer David Goodman’s more lyrical and political sensibilities to its most basic violent elements, and you’d have a film that could be molded and modified to attract a contemporary audience. But what’s most bizarre about Rod Lurie’s remake is that it does not necessarily strip away the original’s sensibilities or sexual politics. They are somewhat intact and shabbily executed, to the point that the film resembles more of a copy than a revisioning. 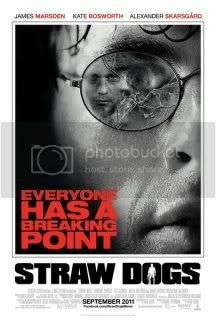 This inherent lack of originality lends one to analyze Straw Dogs (2011) as inferior in virtually every way, and in a way, making the whole picture a little useless. The film’s problems are apparent from the onset. The casting of Kate Bosworth and James Marsden is problematic in that so much of what made Peckinpah’s casting of Susan George and Dustin Hoffman is inverted. Bosworth and Marsden operate as a bland, though stable married couple – they lack a sense of disunity, whereas the original had George and Hoffman operate on opposite ends of a cultural stick. The lack of tension between Marsden and Bosworth serves to highlight the film as strictly an “us vs. them” picture, wherein the group of townspeople (led by Alexander Skarsgard) salivate at Bosworth’s braless disposition. From here we see Rod Lurie’s first critical detour in philosophy from the original. As Bosworth is once again ogled by the townspeople, Marsden notes that perhaps she is bringing it on herself. This sort of just-world hypothesis clearly places Bosworth to blame for the violent act against her that follows, and eliminates any need for critical analysis that follows – she asked for it. But in the original, such misogyny was veiled and layered. 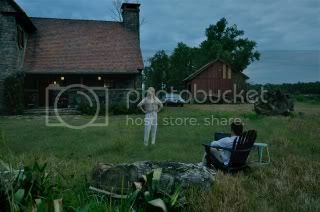 There were many moving parts to the whole scene, whereas Lurie’s rendition of the crucial scene comes across as insincere and one note. Lurie seems to be going for here is addressing a more contemporary political critique. The locale has been shifted to rural Mississippi and the Hoffman role has been reimaged from a mathematician to a Hollywood screenwriter. The film transitions itself into a liberal vs. conservative analysis, wherein the Marsden’s condescending smirk lends itself to education and wealth. It’s an interesting idea in theory, but unfortunately it comes across as far too on the nose to really register as anything unique. What does register is Alexander Skarsgard’s performance, which is the film’s best (and most unnecessary) aspect. He brings about an aura of intimidation and nuance that he genuinely feels like a presence. But when his cronies represent such clear Southern stereotypes, it’s hard to believe that he isn’t the victim of the same brutality that Marsden endures.